In 1947 Micronesia was established as a strategic Trust under the U.N. Security Council, the only Trusteeship set up in this manner after WWII. It became known as the Trust Territory of the Pacific Islands and was administered by the U.S. under the auspices of the United Nations. On July 1, 1951, the administration of the Trust Territory of the Pacific Islands was transferred from the Navy to the Department of the Interior, and was administered by this department until 1986. The political situation in the Marshall Islands and the Trust Territory of the Pacific islands (TTIP) during the 1960’s to the mid 1980’s was a very confusing and uncertain time as to the political outcome of the area. When Micronesia was established as the TTIP in 1947, it was designated as a “strategic trust” and was the only area of the world ever designated as such! The strategic trust meant that special consideration by the Security Council of the United Nations would be necessary in order to change the political status of the TTIP. Since the Security Council’s five permanent members have veto power, the complexity of changing the status in the TTIP was very different than the majority vote by the General Assembly which was necessary to change the status, or grant independence to the other Trusteeships set up after WWII. In 1965 a Congress of Micronesia was established which was the first TTIP representative government organization. TTIP at this time was divided into six administrative districts which were the Marianas, Yap, Palau, Chuuk, Pohnpei, and the Marshalls. The congress was a bicameral elected legislature that originally only had an advisory function to the executive offices of the High Commissioner, who was appointed by the U.S. Secretary of the Interior, and had veto power over the Congress of Micronesia’s decisions. Since the Trusteeship Agreement was to expire in 1981, various types of negotiations and votes occurred throughout the TTIP, and in individual districts during the late 1970’s. The Marianas voted in 1975 to accept Commonwealth status with the U.S., much like the political status of Puerto Rico. Kosrae (formerly Kusaie) was established as a separate district in 1977, so the number of six districts was maintained. In July 1978 a referendum was held by all the districts except the Marianas to accept or reject the Constitution of the Federated States of Micronesia. The constitution was written in Saipan from July to October 1975 by constitutional convention delegates from all districts which included traditional leaders. Each district in the TTIP had differences of culture, language, history, circumstances, wealth, and historically were never united as one. 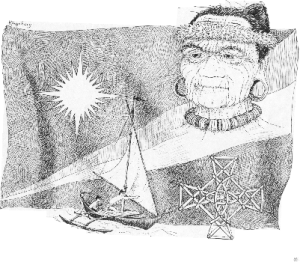 As a result, the idea of a united Micronesia was quickly dissolving. The vote in July 1978 was accepted by the districts of Yap, Chuuk, Pohnpei, and Kosrae, but rejected by Palau and the Marshalls Islands. One of the more heated disputes within the Marshall Islands concerned the money generated by the Kwajalein Missile Range. Most Marshallese felt that this money and the taxes paid by the U.S. people living there should be shared with the Marshall Islands. During the later years of the 1970’s and early 1980’s the political atmosphere in Majuro (District Center of the Marshalls) was very heated and controversial. But the understanding and significance of all this to the people on the outer islands was somewhat minimal. Eventually with extensive negotiations with the United States the Compact of Free Association was established and the RMI became an independent country after the Trust Territory was dissolved by the U.N. Security Council in 1986. 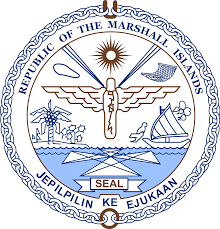 The Republic of the Marshall Islands is fully sovereign in domestic and foreign affairs, but gives responsibility for defense to the United States. RMI became a member of the United Nations in 1991.